Gyral have released a new range of Belt Spreaders to complement their existing product range. 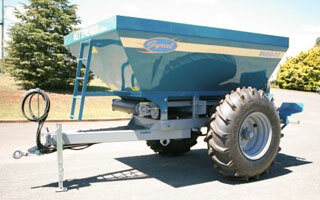 The Spreaders are capable of spreading a range of products from granular fertiliser to lime. A rubber conveyor belt delivers the product to the rear of the machine where it is distributed by dual spinner discs. A range of capacities are available to suit your needs. A highly durable, rubber conveyor belt (800mm wide) is supported by full width steel rollers fitted with stainless steel shafts and Austlon bushes. Hydraulic drive for the belt is standard with the speed adjusted through the flow control valve. Alternatively a hydraulically engaged Vee Belt ground drive with reduction chains and sprockets can be fitted. The dual spinner discs are driven by dual hydraulic motors. There are 4 stainless steel flights, on each spinner, that are fully adjustable. An electric speed sensor is fitted to provide accurate measurement. Spreading width can be up to 36 metres but will depend on the product being used. The rear door is hydraulically operated and uses a manual pre-set (with a visual guage) for easy calibration. Contact us at Excel to discuss your Gyral Belt Spreader requirements.